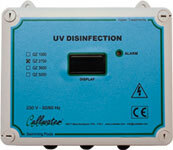 The use of UV RADIATION is now recognized as one of the best technologies for disinfecting water. The UV rays to be found in nature are reproduced using special lamps in pure quartz that contain mercury vapors that, when suitably activated by current passing between electrodes, emits photons with varying amounts of energy in the deactivation phase, originating the characteristic UV spectrum. The inactivation of the pathogen microorganisms is due to the damage by this radiation caused to the molecules of the nucleic acids, which is compromised in their cellular replications. The water's chemical-physical and organoleptic qualities are not altered, the complete absence of by-products of disinfection is currently one of the safest and most commonly used technologies for disinfecting water. Depending on their operating conditions, MERCURY VAPOUR LAMPS are able to emit radiation at different wavelengths. If their pressure and temperature are low, they produce the characteristic monochromatic spectrum (UV-C, λ = 253, 7 nm) with effective germicide action. Cullwater offers a series of UV systems especially designed for swimming pools of small dimensions. Made by a chamber in stainless steel and an electrical panel supplied with a system of digital control, the QZ Pool systems present themselves as simple and functional plants, ideal for obtaining a better quality of water in swimming pools for private use.